This recipe is for a Bread Machine, though I am sure you could make it without. I've made this recipe several times before, almost always for fall, and typically with raisins. It goes wonderfully with the Cran-Apple Butter, which is actually what is spread on the bread in the picture. As you already know, I adore fall and cooking this bread is another way to make your home have that wonderful scent of fall. I tortured my Hubby and his Cousin last saturday night while this bread was baking (and myself too lol! ), and as soon as it was out we devoured some. This is a good hearty bread, wonderful for a quick breakfast. This recipe is for a 1 1/2 lbs. loaf. Should be baked on your Bread Machine's standard setting, and light crust. Place all ingredients in the bread pan. Select Light Crust setting, and 1 1/2 lbs loaf and press start. Observe as the dough kneads, after 5-10 minutes, if it appears dry and stiff or your machine sounds like it's straining, add more water 1 Tablespoon at a time until dough forms a smooth, soft, pliable ball that is slightly tacky to the touch. After it bakes, remove the bread from the pan, and place on a rack or a cutting board and allow to cool 1 hour before slicing (I did not do this... it was WAY too tempting...). We love this bread. It really is a great loaf to keep on hand for a quick breakfast. It could easily also be made with Wheat Flour to be even healthier. 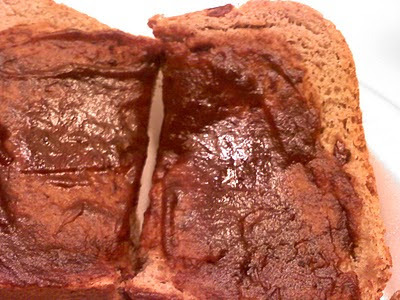 We absolutely love this with Cran- Apple Butter, or even toasted with some cream cheese, or even just plain! 4.5 Stars.